For the Sega Game Gear game, see Crayon Shin-chan: Taiketsu! Kantam Panic!!. 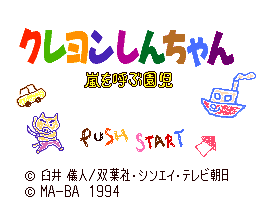 Crayon Shin-chan: Arashi wo Yobu Enji (クレヨンしんちゃん 嵐を呼ぶ園児) is originally a 1993 action game for the Super Famicom by Bandai tying into the Crayon Shin-chan franchise. Ma-Ba ported it to the Sega Mega Drive in 1994. Neither versions were released outside Japan. jumps, rolls and hills (you need a Action Kamen costum to do this) or shoots water (you need a water gun to do this). pauses the game and opens the pause menu for select the cards and use that selected card. All of the minigames have their own instructions. With except of the title screen music, all the songs were replaced in this version. A sound effect is played when a minigame was finished successfully (Mega Drive version only). 3 of the minigames are different from the Super Famicom version. Main article: Crayon Shin-chan: Arashi wo Yobu Enji/Magazine articles.